I love making pancakes. They can be healthy, sinful, comfort food, easy to make and most of all truly delicious. What are pancakes? Sometimes known as griddle cakes, hotcakes or flapjacks they are round, often thin flat cakes made using a starchy batter which may have added milk, butter, eggs, fruits, vegetables etc. There are many varieties of pancakes the world over right from the Indian uttapam to Dutch Baby, crepes, dosas, Chinese Scallions, Crumpets, Johnny cakes, Blini and so many more. Pancakes are served at different meals, depending on where it originates from. Some are served as breakfast, some along with stews, curries or meat/fish and vegetable preparations. Like Injera from Ethiopia is usually served with a variety of stews. Why am I talking about pancakes? Well, remember today is Monday? Mondays means a new theme for the FoodieMonday/Bloghop group. Our #117th theme was chosen by me. I challenged the group to make pancakes from different parts of the world. A few months back,while I was doing the South American cuisine theme for Blogging Marathon,I came across an interesting pancake recipe which I had bookmarked. I decided to make those pancakes. They are called Cachapas. Cachapas or corncakes are Venezuelan Corn Pancakes. Cachapas is the Spanish word for Crumpets. It is a popular street food served with a soft cheese (queso fresco) or any substitute like feta or mozzarella. Sometimes they are simply buttered or served with cream cheese or sour cream. Its also served with ham or chorizo. As I was not able to get queso fresco, I decided to use a local Indian mozzarella brand which refused to melt completely! However, all said and done, the pancakes were simply delicious. I added some chopped chilis. I should have served it with a sprinkle of cilantro or coriander but being a lazy Sunday neither my daughter nor I wanted to get out of our nightwear to go to the shop opposite our apartment to buy some coriander! I really don’t regret for being so lazy… it was a totally ‘me’ day which I enjoyed thoroughly. Daughter and I went to watch the suspense movie Ittefaq. There was not a moment of boredom and loved watching Akshay Khanna on the screen after such a long time. Did I mention both of us went mad shopping for handbags as Central had 50%off on all brands? Mine are the usual ‘aunty’ type bag as she calls them and hers the funky type which you’d never see me carrying around! Lets hop over to the gluten free, not much fat filled pancakes. I combined tips and ingredients from 3-4 different recipes but the basic requirement for these cachapas is corn and cornmeal. Process the corn in a food processor till you get a batter that is not coarse. Transfer the processed corn into a bowl. Add cornmeal, milk, salt, pepper, sugar and egg. Mix the batter thoroughly. It will not resemble a normal pancake batter. Drizzle it with little oil. Drop a heaped tablespoon of the batter onto the hot pancake. Spread it into a circle of about 3-4 inches in diameter with the help of the back of a spoon. Drizzle a bit of oil around it and let it cook. Don’t be in a hurry to flip it over, let it cook well or else it will break. When the underside is done, flip it over and cook. Drizzle a bit of oil. Flip out over again, add some grated cheese and wait till it melts. Repeat steps 8-13 with the remaining batter. I used a big frying pan so was able to make 3 at a time. Serve hot cachapas on its own or folded with some meat or sliced avocados. Try and get some soft cheese that melts or simply serve it with sour cream or cream cheese. Add filling of your own and fold the cachapas and serve. Cornmeal and cornstarch are NOT the same. Cornmeal is flour made from ground dried corn kernels. I used the white cornmeal which is popularly used in Kenya to prepare ugali or use masa harina. I loved when I made these cachapas..they turned out fantastic..very nicely done mayuri..
You always come up with an interesting or innovative recipe di..lovely share ! Yummy and quite interesting !! Should try this out soon!! My daughter loves it with sweetcorn !! Wow, cachapas looks absolutely delicious, cant wait to make some soon. Corn meal pancake looks great Mayuri. Excellent share. I love corn. Would love to try soon. Cachapas have been on my to-make list for a while now. You are tempting me to try them out soon. They look so cheesy and delicious. Sounds like you and your daughter had a great day together. Enjoy!! Wow sweetcorn pancakes sounds very interesting. I will try them soon as my girls love sweetcorn. That is an interesting recipe Mayuri! All the other pancakes too look nice! Very different and nice recipe of pancakes. It is nice to keep trying out dishes from various cuisines of the world. Lovely pancakes Mayuri. would love to try these cachapas. Try them Sharmila, and they are so easy to make. Try them Priya, they are delicious. Thank you Sujata, do try them, they are yummy. Loved your corn pancakes as you've used regular flour Waagmi. Yes we did Pavani, and do try the pancakes, am sure you'll be able to get the typical Mexican soft cheese to add to it. 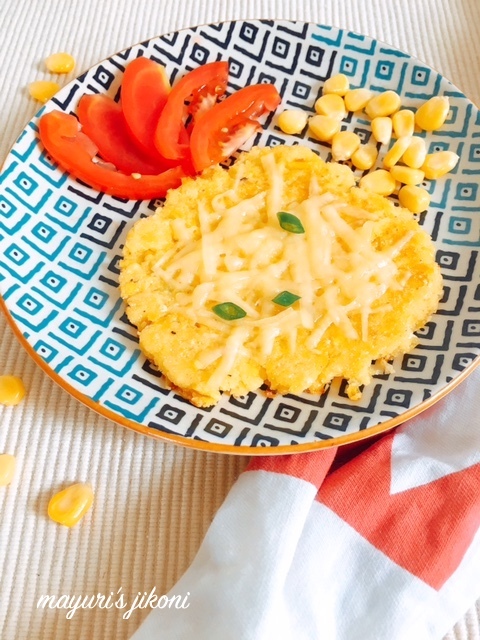 Corn and cheese is a classic combination, am sure it will be a hit at home. Nandita the pancakes were definitely light. I added less cheese but the original ones have loads of cheese on it. Thanks Jagruti, they are try them. Thanks Padmajha, we had a fun theme and yes the others too have come up with amazing pancakes. Nisa thank you so much for trying them out. I'm glad that your kids loved them. Thank you Shobha, its definitely fun to try out new cuisines. Try them Jayashree, they are not heavy and are delicious. Awesome pancakes!You always try out something new and make us drool! These Cheesy Pancakes look so tempting. Fab share Mayuri dee.I love savoury pancakes.Bookmarking it. As a corn lover…these look just perfect to me!! Delicious!